Myself, a scientist, artist, etc. Natural, Outdoors, Local, Vital Basics, Primitive, etc. Above photo: Science and art united. invasive bittersweet vine, in Michigan. bittersweet vine in to a basket. we helped both people and nature. Read whole page for definitions of science and art and how they relate to each other, and examples. outdoor nature science, awareness, observation, knowledge, and facts. In order to make my art, I need to know one or a few of many types of science, including native and exotic plants, native animals, native ecology and habitats, stewardship techniques, economy, conservation, natural resources, hard and soft woods, etc. 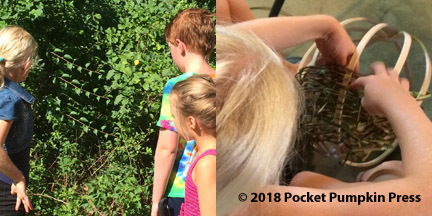 Outdoor nature art, primitive crafts, the community arts, landscape architecture, and nature classes: the skills of heart-head-and-hands in unison to apply science to make stuff to help to connect, sustain, and enrich communities, people, and nature. Culture, living, learning, and working to sustain and enrich people and nature within a community landscape. ● Science is observation, awareness, knowledge, and education. Science is what you learn (take in) from your community and world. "Science is learning the patterns of nature and how nature works." ― Carl Sagan. Science is observation, exploration, research, curiosity, awareness, record, report, discovery, experiment, study, questions, knowledge, experience, wisdom, understanding, facts, theories, truths, and learning the patterns of nature and how nature works, how people can cooperate together to form sustainable communities, how human communities can live in harmony with habitats and ecologies, how cultures and educations and economies affect communities and people and nature, etc. ● Art is expression, creativity, building, working, and applying science to make things. Art is working to make (give out) things for your community and world. Good art is art "in which the hand, the head, and the heart of man go together." ― John Ruskin. Art is expression, creativity, designing, building, working, doing, action, caretaking, stewarding, and applying science to make things ― good art includes art of pleasing form and function, or appropriate form and function. Art is a unique thing that a person or people handmakes. Art is not factory mass-produced identical items. For instance, every handmade basket is at least slightly unique from other baskets. Plus, art is not limited to touchable items (paintings, sculptures, baskets, houses, etc. ): art can also be untouchable forms of expression, such as dance, music, culture, morals, storytelling, and facial expressions. Science and art overlap, in that both science and art include experiment, experience, discovery, wisdom, understanding, and education. Science and art should be done with the motive to love ― to help communities, people, nature, and the world. See my Daily Blog, which includes science and art. Also, see my Holistic Days, which include science and art. Also see my Holistic Science and Art. There is a subtle difference between "community science" and "community art." "Community science" is "learning" how to sustain and enrich communities, habitats, etc. "Community art" is the "action" and "creating things" that help to sustain and enrich communities, habitats, etc. The best sciences and best arts support each other. (Lousy science has little or nothing to do with art; and, lousy art has little or nothing to do with science.) Science should be done to do art. Science includes learning how to do and make things. Art includes doing and making things. I promote learning sustainable science and following it up with doing sustainable art. I do various things that include both science and art, including the following. I make primitive wilderness crafts. I design curriculum and nature classes. I create moral cultural activities: science lessons, art projects, games, and holiday festivities that relate to nature, instead of ignore nature. I live to be moral and to sustain and enrich communities, people, and nature. I take care of nature to promote people's holistic health and well-being. Also, I do landscape architecture. Landscape architects plan and design landscapes of a variety of scales. For examples, they plan and design 2-acre residential yards, 10-acre-parks, 5-mile-diameter communities, and 30-mile-diameter regions. Professionally, I've worked in various facets of the landscape architecture field. I worked at a landscape architecture design firm, at which I designed urban sites, including residential yards, schoolyards, parks, playgrounds, streetscapes, college campus areas, etc. I worked at a city park district. I served on a village planning commission. Lately, I have a few part time jobs. I run my own business, the Galien Valley Nature and Culture Program. I design, author, and illustrate nature curricula and books. I work at an ecological restoration firm, which a landscape architect owns and runs. Also, I do design and work at a permaculture firm. Some landscape architects have permaculture farms. Also, at the permaculture farm, I teach nature, science, art, and interdisciplinary classes. The most famous USA landscape architect of the early 20th-century, Jens Jensen, taught at the Clearing, Jensen's folk school of nature and art classes. Sci-Art Article Entries and Archives: May 2018, June 2018, July 2018, and Holistic Days. See my Holistic Days, which include science and art. See my Holistic Science and Art. Read definitions of science, art, community, culture, economy, education, and many other words, at my definitionz page. See how science and art relates to education and the economy in: The Changes Needed in Education and the Economy: 7 Goals and Success Indicators of culture, education, ecology, and economy. See science and art in 40 ways to sustain communities, people, and nature.